Combine TABASCO® Sauce and mayonnaise. Place into a squeeze bottle with a small-holed tip and place in the refrigerator. Pull duck confit off the bone; roughly chop. In a 2-in. full hotel pan, spread bacon & onion jam. Place duck confit over top. Preheat oven to 350ºF. Place the hotel pan into the oven for 12 to 14 min., until both jam and duck are hot. While duck is in the oven, place duck fat and fry oil into a 15-lb. fryer. Heat to 350ºF. When oil is hot, fry the fries until golden brown and crispy. 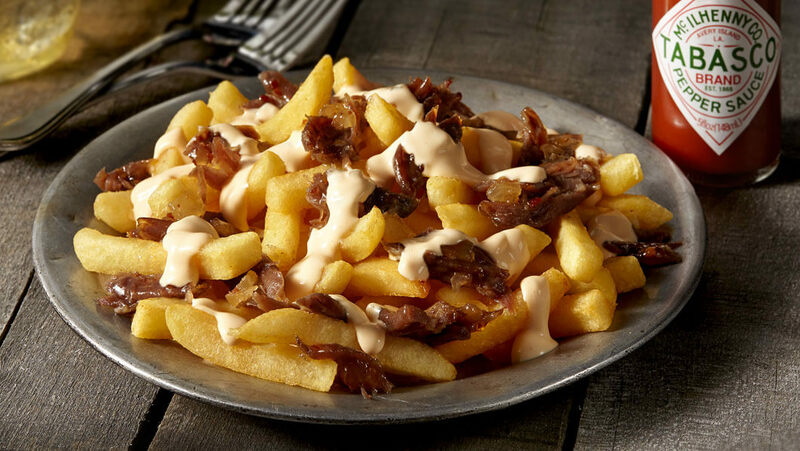 Lay out fries; remove hot duck confit and jam from the oven, and spoon over the top of fries. Drizzle the TABASCO® Sauce and mayonnaise mixture over top.